Have you seen Myna birds in your local area? 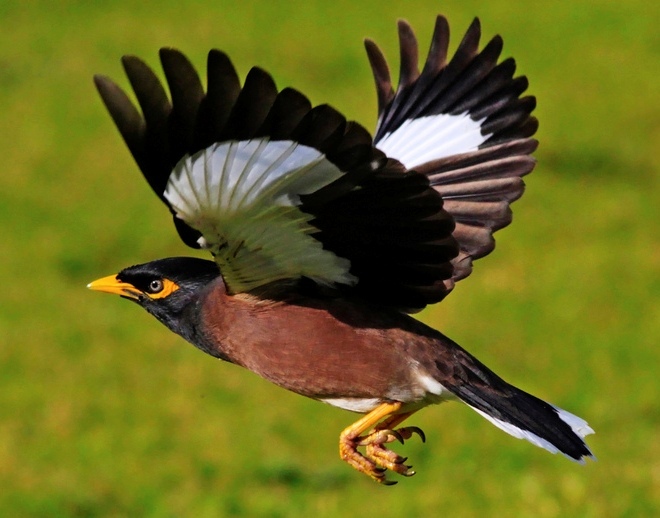 MynaScan is a community website that allows you to record and map sightings of myna birds, their impacts, and control activities in your local area. Use MynaScan data to help decide where to control myna birds in your local area. 1. Register your details here. 3. Find out more before starting. Do you need MynaScan brochures? Do you need an information flyer about Myna Birds for your local community? We have a FREE hand-copy MynaScan brochure (download PDF) that can be used to identify Myna Birds, and describes how to report sightings via MynaScan. To request these brochures, please email feralscan@feralscan.org.au and we will send you these brochures free-of-charge. Simply register and login to record the location of myna birds in your local area on the MynaScan Google Map. Information entered can help to coordinate myna bird control activities. MynaScan hosts a new community facility. By creating or joining a group, you can (1) keep members informed about current problems, (2) work together with members to target problem areas, and (3) measure the outcomes of control across your local area. Reducing Myna bird impacts is best achieved when control is coordinated at local and regional scales. Catchment groups, regional biosecurity groups, and local councils are now connecting to MynaScan. Use MynaScan in your local area to help keep your regional group(s) informed about myna bird problem areas.